Making felt Christmas stockings is a simple and festive project suitable for kids of all ages. Felt is one of the most forgiving fabrics around, which makes it ideal for children's crafts. When it comes to making your own felt stockings, you can either purchase a kit or buy individual materials and craft from scratch. Either way, felt's soft and velvety surface adds warmth to the holiday season. You can find affordable felt Christmas stocking kits at craft stores and select discount retailers during the months of November and December. Basic kits come with a stocking pattern, needle, thread, instructions, and various accessories to decorate your finished product. Melt Your Heart features two snowmen in a cute, wintry scene. Sugar Plum Fairy features a beautiful ballerina surrounded by sweets galore. Use an old or inexpensive store-bought stocking and make your own pattern. 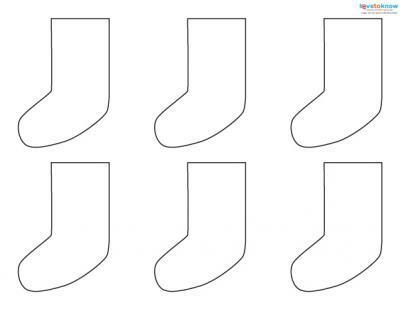 When tracing the stocking on a piece of heavy paper or cardboard remember to leave a 1/2-inch seam. Choose one yard of your favorite color felt for each stocking. Fold the felt in half, lengthwise, right sides together. Pin your paper pattern to the fabric and cut out the stocking. Pin the two stocking pieces together making sure the edges match up evenly and that the right sides of the stocking pieces are facing each other. Sew the stocking pieces together, roughly a 1/2-inch from the raw fabric edges. Remove the pins as you sew. Turn the stocking right side out and decorate it with your favorite accessories. Crafting felt stockings is the ideal cure for cabin fever on cold and snowy winter days. Make it a family affair by lining a table with pre-made stockings and big bowls filled with accessories. 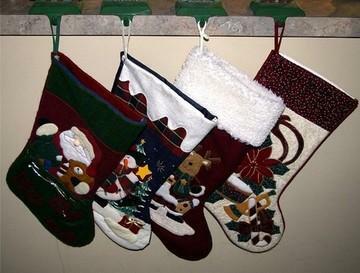 Then, have each family member personalize individual stockings to be given away as gifts. Personalize a felt Christmas stocking for your favorite teacher by decorating it with stickers of apples, pencils, pens, and rulers. Then, use glitter glue to spell out your teacher's name on the stocking's cuff. Glue a picture of your pet dog or cat on the stocking. Embellish the photo with a silk ribbon collar. Use scrap pieces of felt to design a dog bone or a doghouse, and then glue the pieces onto your stocking. Don't forget to add your pooch's name on the stocking with a permanent marker or letter stickers. If your best friend is a musician, consider decorating his Christmas stocking with black and white piano keys made from leftover felt. Next, add musical notes with glittery borders. A male boss' stocking could be embellished with material from a real silk tie as well as wool or fur trim. For a female boss, consider using scraps of satin, tulle or velvet along with sequins, glitter and gemstones to decorate a basic felt stocking. Handmade stockings have an undeniable charm regardless of how you choose to decorate them. Let your creativity take over and have fun in the process.